We thank you and value your purchase of Talitor products ! All products direct purchased from Talitor will be covered with a product warranty. To let you experience an excellent after-sales service, we strongly recommend our customers to read over below message. It is Talitor’s goal to provide a worry-free business relationship. Your collaboration is always appreciated. All products shipped from Talitor are basically warranted with a period of 12 months from the date of commercial invoice issued, unless otherwise stated case by case. For example, extended warranty period can be provided by extra payment, which depends on case-by-case transaction terms and conditions stated on each individual sales confirmation. The foresaid warranty does only cover product failure due to defects in materials or components which occur under normal use condition. It does not cover damages or failures caused by misuse, mishandling, abuse, neglect misapplication, accident, alteration, faulty installation, modification by user, failure of working in associated with other non-verified products, Acts of God. 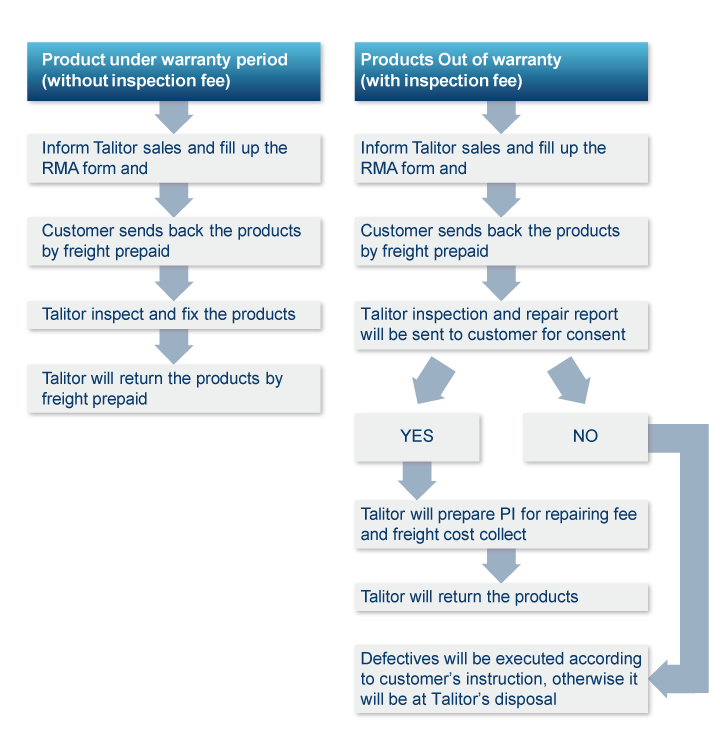 In the event of a defect reported from the user, of which the reporting date is within effective warranty period from the date of original invoice issued by Talitor, Talitor will replace the product with a whole new substitution or repair the product with new or rebuilt parts with free of charge. This product warranty is extended only to the original purchaser and is not transferable. With regard to return Materials that within warranty period, Talitor take time to analyze and diagnose the failure condition, and will repair or replace the Returned Material. It will take normally within 40 days upon receipt of the same, and the backward shipment to customer will be done consecutively. Return Material that beyond warranty period or out of warranty coverage will be charged at minimum repairing cost and other expenses if any. Customer is liable for shipping cost of both return and backward shipments. All returns must be obtained a Return Material Authorization Number (RMA #) from Talitor in prior to its shipment back to Talitor. Customer should contact Talitor's sales for issuing RMA#, thus a RMA form will be requested for customer to fill out. Through filling - out RMA form, we can filter out unnecessary problems that might not need to return material. For example, some problems can be solved by software up-gradation which can be done through internet, or it's simply just misunderstanding of product application, etc. Regarding to return Materials that within warranty period, Customer is required to pay shipping cost, and if any expense may occur at customer's side during the return of shipments. Talitor will pay shipping cost for backward shipment of after repaired or replaced product to customer. Talitor would not be liable for any other cost that may occur during a backward shipment to customer, eg. import duty at customer's side. To avoid an "import duty" may occur at Talitor's side, in which sending the return materials to Talitor for service, customer can choose a preferred courier for economically parcel sending, but need to follow Talitor’s document preparation instruction. Customer to contact Talitor sales for telling cause of defect, condition of product and etc., by filling out a RMA Form. Talitor to issue Return Material Authorization number (RMA#). Customer to ship the Return Material by a preferred courier, with 15 days upon the receipt of RMA# from Talitor. When returning defectives to Talitor, the product package must be well packed under a good protection condition with all accessories included; otherwise the missing accessories will not be added to the backward shipment to customer. Special case with Talitor’s agreement is not subjected to this limitation. The product package must be enclosed with at least one copy of finalized RMA Form with RMA#. If there is more than one piece of similar product included, each with a note specifies the condition of defect is required. All documents for transportation must appear "Return merchandise for warranty claim". This is to avoid unnecessary custom taxes. Talitor to ship repaired or replaced product normally within 40 days after received the returns.